Michelle Charlesworth has more on the heroic rescue of several people from a burning condo in New Jersey. 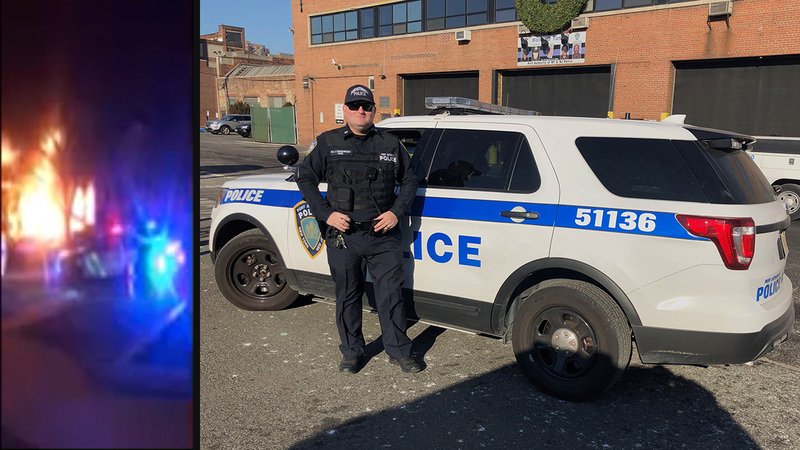 NORTH BRUNSWICK, New Jersey (WABC) -- Several police officers are being hailed as a heroes after they rescued residents from a fire at a condominium complex in New Jersey over the weekend. Authorities say Port Authority Police Officer John Shaughnessy was leaving his townhouse in North Brunswick around 10:30 p.m. Saturday when he observed flames coming from the first floor of the condo units approximately 50 yards from his residence. Shaughnessy immediately went to assist as North Brunswick police began to arrive on scene. He and the responding officers began banging on windows and the walls of the first floor units to alert the occupants about the fire. The officers eventually saw a family of four, including a 4-year-old girl and her 6-month-old baby brother, trapped on a second floor balcony and jumped into action. North Brunswick Officer Joe Grasso quickly scaled the building to reach the victims. Bodycam footage shows officers rescuing several people from a burning condo in New Jersey. "I did a pull up onto the second-floor balcony, and from that point, I started to assist lowering the children down to my fellow officers," he said. "It was very terrifying." Grosso lowered the two children and their grandparents about 15 feet down to Shaughnessy, with the assistance of additional police personnel who had arrived on scene. "He lowered them down to the other personnel that were down there," he said. "In one video...you can see me running with the 4-year-old toward my neighbors. The most important thing to me is not being a hero, it's that everybody got out alive. There's nothing more important than that." The fire resulted in the loss of 12 condos on the property, and authorities say 28 people -- half the residents of the condo -- are now homeless. North Brunswick police say 15 people escaped on their own or had to be rescued, while 13 were not at home at the time. The cause is believed to be a menorah candle.